Lyrics to the song This Is Tomorrow as recorded by Bryan Ferry. This song was released as a single by Bryan Ferry in 1977 with a non album track As The World Turns as it's b-side. The song peaked at number 9 in the UK charts during it's 9 week run. The title 'This Is Tomorrow' was inspired by a hugely influential exhibition of Pop Art at the Whitechapel Art Gallery in London, devised by Richard Hamilton, who had taught Ferry at Newcastle Univesity. This Is Tomorrow was performed live during Bryan Ferry's 1977 tour but hasn't been performed since. 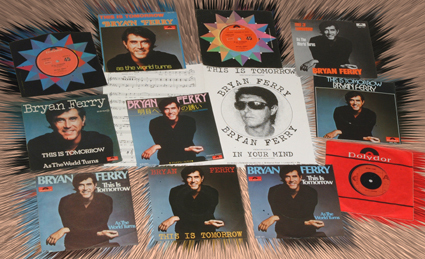 A promotional video was shot during the 1977 tour during a sound check in Japan and is available on the DVD released with The Best Of Bryan Ferry in 2009.